For the later Greek writer see Xenophon of Ephesus. Xenophon (Greek, Ξενοφῶν; c. 427 B.C.E. – 355 B.C.E. ), was a Greek mercenary, historian and follower of Socrates. In 401 B.C.E. he participated in an expedition led by Cyrus the Younger against his older brother, the emperor Artaxerxes II of Persia. He found himself stranded deep in Mesopotamia with a group of leaderless mercenaries, the Ten Thousand, who fought their way north to the Black Sea and eventually sailed back to Greece. His record of this experience, the Anabasis ("The Expedition" or "The March Up Country") was used as a field guide by Alexander the Great during the early phases of his conquest of Persia, and later became a textbook for students learning Greek. Xenophon wrote several works on political leadership and The Hellenica, seven books of history covering the forty-eight years from the end of the History of Thucydides to the Battle of Mantinea. He also wrote a fictionalized account of the career of Cyrus the Younger. In his youth he was a student and follower of Socrates, and wrote four works about Socrates in the form of dialogues. The Memorabilia defends Socrates against charges that he was irreligious and corrupted the youth of Athens. Xenophon’s works concentrated primarily on ethics and political philosophy. His works were held in high esteem by the Romans, and influenced later European political thinkers including Niccolò Machiavelli, Michel de Montaigne and Jean-Jacques Rousseau. In 401 B.C.E. Xenophon was invited by his friend Proxenus to come to Sardis and join Cyrus the Younger in an expedition against his older brother Atatarxes. Xenophon says that he had asked Socrates, himself a veteran soldier, for advice on whether to go with Cyrus, and that Socrates referred him to the divinely inspired Delphic oracle. Xenophon's query to the oracle, however, was not whether or not to accept Cyrus' invitation, but "to which of the gods he must pray and do sacrifice, so that he might best accomplish his intended journey and return in safety, with good fortune." So the oracle told him which gods to pray and sacrifice to. When Xenophon returned to Athens and told Socrates of the oracle's advice, Socrates chastised him for putting the wrong question to the oracle, but said, "Since, however, you did so put the question, you should do what the god enjoined." In his advance against the Persian king, Cyrus used Greek mercenaries left unemployed by the cessation of the Peloponnesian War. The Greeks defeated Artaxerxes in the Battle of Cunaxa, but Cyrus was killed. Shortly thereafter, the Greek general Clearchus of Sparta was invited to a peace conference, at which he was betrayed and executed. The Greek mercenaries, known as the Ten Thousand, found themselves without leadership deep in hostile territory, near the heart of Mesopotamia, far from the sea. They elected new leaders, including Xenophon himself, and fought their way north through hostile Persians, Armenians, and Kurds to Trapezus on the coast of the Black Sea. They then sailed westward back to Greece. On the way back, they helped Seuthes II make himself king of Thrace. In 399 B.C.E. Xenophon joined the Spartans, who were at war with Tissaphernes and Pharnabazus, and he remained with Agesilaus, commander of the Lacedaemonians, when they fought against Athens (394 B.C.E.). As a consequence, a decree was passed in Athens exiling him. It appears that after the battle at Coronea, Xenophon went to Sparta, and then settled at Scillus in Elis, where he was joined by his wife Philesia and his sons, Gryllus and Diodorus. He lived there for some time, writing histories, hunting, and entertaining friends. When Scillus fell to the Eleans, he and his family escaped to Corinth and settled there. Athens decided to raise a military force to assist the Lacedaemonians, and Xenophon sent his sons, since they had been educated in Sparta, to join them. Gryllus died fighting gallantly for Athens at the battle of Mantinea, and this may have been a reason why Xenophon’s exile from Athens was revoked. There is no evidence that he ever returned to Athens; Diogenes Laertius reports that Xenophon died in Corinth at an advanced age. His date of death is uncertain; historians only know that he survived his patron Agesilaus, for whom he wrote an encomium. Xenophon's writings, especially the Anabasis, are often read by beginning students of the Greek language. His Hellenica is a chief source for events in Greece from 411 to 362 B.C.E., and his Socratic writings, preserved complete, are the only surviving representatives of the genre of "Sokratikoi logoi" other than the dialogues of Plato. 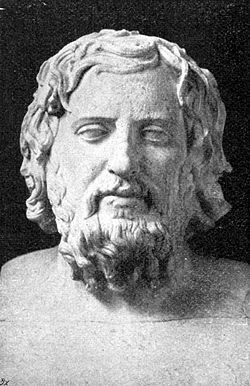 Xenophon was a man of action as well as a philosopher, and his military experience and his physical accomplishments deeply influenced his thought and his writing. His philosophical works were mostly concerned with ethics and political philosophy, and with the application of philosophy in practical matters. He devoted himself to an examination of the character of man and the psychology of human virtue; whether, and how, it could be taught; and how far a person could go in attaining self-sufficiency. Diogenes Laertius writes that Xenophon was sometimes known as the "Attic Muse" for the sweetness of his diction; very few poets wrote in the Attic dialect. The Anabasis ("The Expedition" or "The March Up Country") is Xenophon's record of Cyrus’ expedition against the Persians and the journey home. Though it contains descriptions of skirmishes and battles, it is more an analysis of character and leadership than a military history. Xenophon describes the character of the younger Cyrus, saying, “Of all the Persians who lived after Cyrus the Great, he was the most like a king and the most deserving of an empire.” Chapter six describes the character traits of five defeated generals who were turned over to the enemy. The Greek general Clearchus is quoted as saying that “a soldier ought to be more frightened of his own commander than of the enemy.” Meno, the eponymous character of Plato's dialogue, is described as a man whose dominant ambition was to become wealthy. Agias the Arcadian and Socrates the Achean are remembered for their courage and their consideration for friends. The Anabasis immortalized Xenophon. It was the first work which made the Greeks acquainted with some portions of the Persian Empire, and was used as a field guide by Alexander the Great during the early phases of his expedition into Persia. The Cyropaedia (The Education of Cyrus) was a fictionalized account of the rise to power of Cyrus the Great, founder of the Persian Empire. Hellenica is a history composed of seven books, covering the events of the 48 years from the time when the History of Thucydides ends to the battle of Mantinea. Agesilaus is a biography of Agesilaus II, the king of Sparta, and a friend of Xenophon. Xenophon was a devoted admirer of Socrates in his youth. According to Diogenes Laertius, Socrates died a year after Xenophon went to join the campaign of Cyrus against the Persians. Diogenes also credits Xenophon with being “the first person who took down conversations as they occurred, and published them among men, calling them memorabilia,” and “the first man who wrote a history of philosophers.” Xenophon was a contemporary of Plato, and there is a possibility that some of his material was drawn from Plato rather than directly from Socrates. The four books of the Memorabilia of Socrates were written by Xenophon to defend the memory of Socrates against charges of being irreligious and of corrupting the Athenian youth, by showing that his conversations, in fact, encouraged goodness and virtue. The work is presented as a series of conversations between Socrates and a variety of people, in which he develops and inculcates his moral doctrines. The Apology of Socrates is a short speech explaining why Socrates preferred death to life. The Symposium (Banquet of Philosophers) is presented as a meeting of philosophers at the house of Callias, a rich Athenian, to celebrate the Great Panathenaea. Socrates is one of the speakers. The Hiero is a dialogue between King Hiero and Simonides. The king speaks of the dangers and difficulties of being in a position of power, and the superior happiness of living a private life; while the poet enumerates the advantages which come with the possession of power, and the opportunities which it offers to be of service to others. The Oeconomicus ("The Complete Householder") is a dialogue in which Socrates gives instruction to Critobulus, on the administration of a household and property. In addition to his long historical works and his Socratic writings, Xenophon produced several short treatises on topics of interest to him. The Hipparchicus contains military precepts and talks about the duties of a commander of cavalry. De Re Equestri is about horsemanship, how to judge a horse when buying it and how to train it. The Cynegeticus is about hunting, and the breeding and training of hunting dogs. Republica Lacedaemoniorum is on the constitution of the Spartan states. De Vectigalibus (Ways and Means), examines ways to increase the revenues of Athens. This page was last modified on 1 August 2013, at 14:24.